The 'Moeller Stroke' ... What is it? Video Examples on Page Three ..
Introduction (A salute to Jim Chapin begins on page two). To clear up a Moeller misconception ... Sanford A. Moeller's book doesn't describe 'his' method, but rather it presents a method that depicts the vintage 'ancient style' approach to snare drumming. This was how playing a drum was done for hundreds of years. Mastering the techniques in Sanford Moeller's writings, will give anyone an excellent foundation on which to build one's own personal technique. Most percussion specialists, and nearly all drummers, do not realize that the system of drumming, found in the 'Moeller book', is centuries old ... and does not belong exclusively to Moeller. One can recognize this 'traditional school' (open style), by the player's utilization of a traditional left hand 'rabbit grip' (loose & relaxed), and a right hand grip that few drummers are familiar with - using the little finger. * IMPORTANT: The little finger 'open style' grip (just described) is one of two grips that Moeller recognizes in his book. The 'second grip' utilizes the thumb fulcrum (closed grip approach). See page 11, in Moeller's book, for a picture. 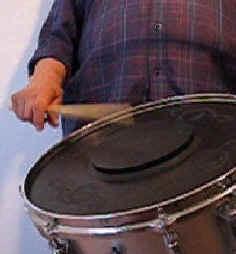 The 'closed style grip' is usually associated with drum set, pipe band drumming, orchestra snare drum and other situations where rendering a closed roll is required. Did Moeller invent techniques in the 1920s, which started an original, new system of drumming? [Moeller] "has not invented any NEW SYSTEM of drumming or discovered any mystic hitherto unknown way to make a roll"
"Have you learned the Moeller Method yet?" "Ah, do you mean the standard and authentic traditional approach to the art of snare drumming that Moeller talks about in his book?" "Yeah ... the 'Moeller method', have you caught on to that method yet?" "Well, what he talks about in his book is not anything he came up with on his own, so why do you call it the Moeller method? " "It's just the Moeller book" "The method, itself, is old ... it's ancient"
"The way I play has nothing to do with me." "I am one generation removed from the greatest...that ever played...'the little kids' in the Civil War." "They HAD to get a bounce." "Those old drums had TERRIBLE heads." Conclusion: Moeller Is Really a MESSENGER! It is common knowledge that there are many differing opinions about Moeller. Confusion exists as to what his book REALLY talks about. With this in mind, how might one go about choosing a qualified teacher, or go about purchasing a book (with CD/DVD), or other instructional aide? In other words, if the legacy of Moeller has caught your attention, where should one begin? To begin with ... realize that there is no such thing as a 'Moeller method' ... Those who claim otherwise, have not read the 'Moeller book' carefully! Although, the phrase: 'Moeller method' gets bantered around by all of us ... those familiar with Moeller's writings, are aware that the techniques are really not 'Moeller techniques', at all. Somewhere along the way, it started to catch on (among drummers and musicians), that the information and explanations attached to the various ideas in Moeller's book were, in fact, a new system that all should bow to (the 'Moeller system'). THIS IS EXACTLY THE OPPOSITE of what is printed in the first few pages of his self-teaching manual. It is this author's opinion, that students should always be told (when Moeller's name is mentioned by their teacher), that what is being shown to them, actually comes from Sanford Moeller's writings, to include, as well, his unique points of view. In other words, one should be slow to follow drummers who insist that they have information concerning a mysterious 'Moeller stroke', for instance, or a Moeller 'whip-type motion', etc. Many of these terms have been invented or coined in recent years, and they have gradually replaced some of the names and descriptive terms in Moeller's book! This is probably the major reason for all of the differing opinions and positions concerning Moeller. Now-a-days, his name is associated with a number of concepts not found in his writings! This is not entirely useful, however, because too many terms will increase the clouds, as it were, over an already cloudy issue! In other words, many drum set educators and pro drummers have stopped extolling some of the book's concepts, such as the up stroke technique. In some instances, some have replaced the term, up stroke, with their own particular term (which in some cases has nothing do, whatsoever, with what Moeller was writing about)! THE USUAL MISTAKE, IS TO ASSUME THAT THE CONCEPT, UP STROKE, REFERS TO WHIPPING THE TIP OF THE STICK UP! Moeller writes that it is the hand that moves up, not the tip of the drumstick (which must remain pointing down in order to continue tapping the drum). Also, there are several other popular word-concepts, such as, a 'Moeller grip', a 'Moeller whip', a Moeller this' or a 'Moeller that', which should not be associated with Moeller, as well. None of the preceding terms are original to Sanford A. Moeller, per se, and it is very confusing to young drummers, if someone furthers their own view, and passes it off as the best way to demonstrate Moeller (instead of demonstrating what is actually found in Moeller's book). But if the information, that is given to a student, is not covered in Moeller's writings, then the techniques should not be referred to as Moeller! Drum set is not how one should think about Moeller, anyway! If one wishes to explore the drum kit, Moeller's students (and others) should be studied (Jim Chapin, for example). So, how can ANYONE say that they 'know' the secrets of the so-called 'Moeller technique' approach (or 'Moeller method') ... since Moeller did not invent a new direction to go in! He merely had a different & unique way to describe what he had observed from studying the retired civil war veterans, whom he sought out and interviewed. It should be noted, by the way, that over the years, there have been many who have NEVER viewed drumming the same way as Moeller did. Notice the term, eurhythmics, on page 69 in Moeller's book ... a term rarely understood and ignored by most. Think about the many conflicting 'Moeller explanations' on the Internet! Dot coms are appearing, each claiming to have the best teaching formula as to what the 'Moeller method' is all about! One may very well be told what a so-called 'Moeller stroke' is, but it will probably be different from someone else's take. Unfortunately, even though we (teachers) may have the same basic concepts in mind, it doesn't help to create more words and phrases to talk about them. The terms in Moeller's book are very clear ... why is it necessary to circumvent what has been written by Moeller, and substitute something else (saying, 'this is the best way to go, because the book was written too many years ago', or 'this is what you will have to learn, first, in order to understand the 'Moeller technique'). A good example, is to look at Moeller's terms for striking a drum (basically three positions). Careful study reveals, that others have added such terms, as: quarter stroke, half stroke, full stroke, pick up stroke, pull up, etc. etc. This means that when more and more terms are added to the general discussion, the material that Moeller talks about, will become more and more unclear (and end up becoming needlessly mysterious and misunderstood). Now-a-days, a young student usually consults their favorite drummer or teacher, for answers about Moeller. And most, after doing so, obviously feel that their guy gave them the real deal (as far as mastering the 'Moeller method', is concerned). And more often than not, the student might be told that they have to understand the half stroke, first ... and then the 'Moeller pick up stroke', or the pull up maneuver, or full stroke, first etc. In other words, the student may be told ... 'once you get those right, you can then learn Moeller'. The truth is that, Moeller's book stands by itself, without any help. Common sense should tell us that too many terms will continue to generate more and more confusion. Since many terms are around, now-a-days (terms that are not found in Moeller's writings), mystery and confusion will go on and on, with each of us quoting from our individual sources (and different explanations). It would be more correct to describe the method of drumming (found in Moeller's book) as: the standard and authentic traditional approach to playing a drum. It is a method, as to how to play a drum proficiently, that has been passed down through the ages. This is what is in the book! And to say again ... many have missed understanding the following point. Moeller talks about 2-grips that a drummer should learn, not one! Few have recognized that a modified grip is mentioned in his book. Unfortunately, most have accepted the book as being only for the 'rudimental types'. This notion has left the door open to further the idea that Moeller's writings need a lot of modifications, in order to be relevant. And so therefore, drummers have come to believe that the only way to understand the 'Moeller book', is to listen to their favorite drummer tell them what's in the book! For many, however, this turns out to be somewhat disappointing. Note: The Moeller matched grip using the 'back of the hand grip' (below) is a very useful and powerful grip to learn ... one should use it whenever it's called for. This grip is rarely taught, however, but should be learned and definitely should be used by the 'hard' players. Jim Chapin talked about the 'little finger grip' for years (for the 'hard hitters'). THIS INFORMATION STEMS RIGHT FROM MOELLER'S BOOK ! ... but it has come to be thought of as: "Oh, that's the rudimental grip (open style). I can't use it because I play rock or jazz". And all of those drummers are missing an important point that was usually brought out at Jim Chapin's clinics ... Chapin (like Moeller) suggested that we learn more than one grip! When one thinks about it, there are probably very few pure 'Moeller advocates', and Chapin deserves to be referred to as having been one of the best representatives of Moeller's book. Chapin suggested to drummers that the little finger stick grip was ergonomically better for playing hard backbeats. He was certainly NOT saying ... it's a grip for the old fashioned rudimental players, only' (as many have said for several decades since the 1930s). In recent times, more and more drummers have been learning both grip approaches. Refer again to the Chapin photo (above). This connection is an excellent point to make about Chapin. He realized that the 'little finger grip' would be the best grip to develop for the 'hard rockers'. Pointing out this 'other use for learning a strong, rudimental grip', was Chapin's genius. Information in the Moeller book predates orchestral snare drumming, pipe-style drumming and so forth. The method goes back hundreds of years ... to a point in time when 'town drummers' played double strokes on a loose, damp, animal skin. Pipe style drumming, of course, couldn't evolve (entirely) until drums and drum heads made it possible to play a closed roll on a tight drum. The 'Moeller book' discusses a unique school of drumming that dates back to the European middle ages ... and perhaps earlier. A great source to prove this point of view, is to admire the old paintings (from previous centuries) where a drummer, or in some cases a tabor player with a pipe, is depicted showing off his craft. A person looking at the picture, would be able to identify the school of drumming involved. This can be done by merely noticing the stick grip. In the picture, above, or old painting (as it were), the vintage drummer image is definitely utilizing the 'little finger grip'. The right hand is relaxed and is holding the stick almost entirely with the little finger. The image tips off the picture's viewer as to what tradition or drumming style is being utilized. Paintings from centuries ago, provide excellent windows. One can admire these vintage paintings, and while doing so, it is possible to also 'see' how things were done throughout history, as paintings were meant to be photographs. Most drummers think about these issues this way ----> Moeller invented an original new method for drummers in the 1920s. If this is what one thinks, then he/she is not on the right track. But if one refers to this method of drumming as the time-honored-age-old-way of learning to play a drum, then this view will be the same view as to how Moeller, himself, thought about drumming ! And on a related subject ... it serves little purpose, it seems, to call a method or technique a 'modified Moeller'. Either the concepts being taught are from the 'Moeller book', or they aren't. Remember, Moeller talks about the 2-grips approach as being necessary and useful to learn ... and many have missed this! Recall, that he calls attention to a 'shift of position' (page 11) when modifying the grip from rudimental to closed (in order to better manage playing a set of drums, for instance). During the 1920s and 30s, popular music featured set drummers as full fledged soloists ... and that was new! When Gene Krupa put rudiments to a set of drums, the whole jazz world noticed, and they noticed Moeller in the process. Again, information that Moeller compiled in his writings is not what's new ... applying that information to a set of drums, is what has been new (since about the 1920s). To say again ... there IS such a thing as the 'Moeller book' (an American treasure) ... but there is no such thing as a 'Moeller SYSTEM' or 'Moeller METHOD'. His uniqueness (Moeller's unique philosophy), was that he described the fluid movements of the civil war drummers as being part of a larger concept called eurhythmics ... (page 69 in the 'Moeller book'). Moeller will no doubt be remembered for this unique point of view ... talking about movement and motion was part of Moeller's lessons. Chapin approached his teaching in somewhat the same way, (concentrating exclusively on the drum set). If one is interested to find out about how Moeller's influence can help to develop a well-rounded drummer .... Jim Chapin, was perhaps the best model for anyone to begin with, in the early stages. And since Moeller states in his book, "no one drummer knows it all", why not follow his advice and check out your favorite pro drummer and drum set educators, as well. There is nothing wrong with wanting to gather a more complete picture, by considering what others have found when they have studied the ideas and materials in the 'Moeller book'. Just remember to be selective. At this point in time, nearly fifty years after Moeller's passing, if a student is keen to learn something that Chapin demonstrates, then it should be called a 'Chapin-style technique' (who just happened to be a Sanford Moeller pupil). They both come from the same school or playing style. They learned how it was done historically, first. While Chapin became an extremely successful author/educator for set drumming ... Moeller, obviously, preferred to stay with the open rudimental style (one player-one drum). If one accepts the fact that Moeller did not invent anything new, then there is 'no Moeller anything' that Chapin learned. What Chapin learned, is the same as what Moeller learned! Chapin is merely applying Moeller's lessons to the drum kit (just as Krupa did ... just as you, the reader, can)! To sum up, Moeller's uniqueness, was his view concerning the concept of eurhythmics and drumming. Chapin brought up this concept at his clinics, and special appearances. Can anyone, reading this article, cite a drum set educator or a drummer/percussion-specialist today who discusses a drummers movements and motions as part of a drum lesson (as Moeller and Chapin did)?